For more information see Setting the Configuration Variables. NOTE: The format of the Metric Creation Wizard is slightly different in Version 3. 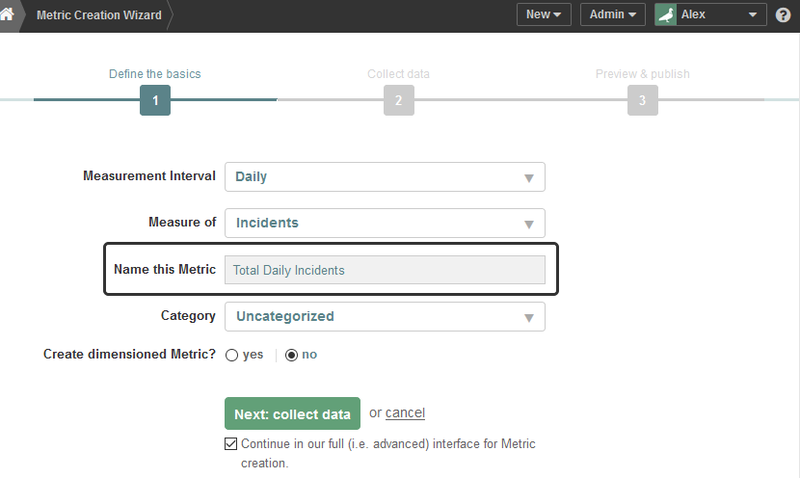 Metric Insights defaults element's Name and Description based on the Measurement Interval and Measure Of settings selected when defining a new element; for example, 'Daily Incidents. Name = "Total Daily Incidents"
Description = "Total Daily Incidents Metric"
Description = "Daily Incidents for a Hotels Metric"
NOTE: You can change the UNDIMENSIONED_METRIC_NAME_PREFIX to any values, such as 'Overall' or set it to the empty string.